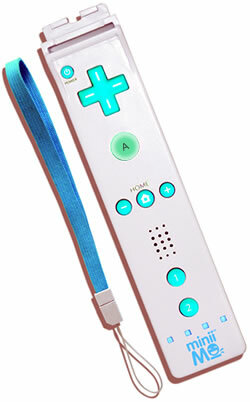 Wii remotes for the wee ones! The Wii as we all know is very much a family orientated game. There’s been a few variations in controllers – driving wheels, tennis bats and even golf clubs! The Wii remotes always struck me as being a little big for younger children, always having to stretch to the buttons when using it with one hand. For a console that’s mainly aimed at young kids, this is somewhat of a design flaw. 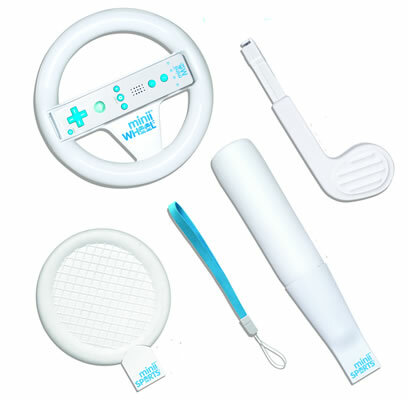 Minii Me, have produced an entire range of Wii remotes from the remote and nunchuck (£9.95) to the wheel (£4.95), light sword (£8.95) and other sports add-ons (9.95) (including Wii Resorts mega pack! £14.95). Retailing at £24.95 for the main remote and the additional packs at very reasonable prices, this is the perfect present to make your little ones feel special! I tried out the main remote along with steering wheel on my 5 year old step son. They were an instant hit. Setting up is the same process as with the normal size remotes. After hours of play, on Lego Star Wars no less, they performed very well. The only thing I noted whilst observing play, was the lack of connectivity when the batteries started to run low.